Everyone wants to be more secure at home but no one wants to live in a fortress. And that is the beauty of our residential door system. It means that the door frame has the strength and reliability you need to keep your home safe. But because the system is fitted to all of our wide range of stylish high performance residential doors, you can choose security without compromising on the great looks of the door. A basic PVC-U door may look solid - but it will provide a very low standard of security, especially if it is only fitted with cam locking devices. These just won't stand up to a thief with a jemmy. In tests, doors with simple cam locking mechanisms were forced open in ten seconds or less. So it is imperative that you think carefully about your choice of door. As with the window styles there are many different styles of doors to choose from and they can be chosen to complement the style of your home. All of which can be fitted using a combination of glass, moulded panels and integrated frame section. Most PVCu single doors are fitted using moulded panels. However, we are finding that cruciform doors and half cruciform doors are becoming more popular. 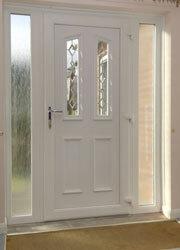 These doors can also be glazed with a vast number of leaded or decorative glass designs which are available. The most popular design of door for a patio is a French door. A French door has many advantages, it can be used as a single door for easy access and when both doors are open provide easy access for furniture. Outward opening doors is a popular choice so there is no detriment to the floor space of the room when the doors are open We install all our French doors with handles on both doors for ease of use, all are fitted with heavy duty adjustable flag hinges and high security locking. Available in a huge variety of styles, colour options and woodgrain finishes, we have an entrance door to suit your home. Floor tiles, plastered internal walls, electric’s are all finishing touches that we offer. Why not ask for a broken down quotation so you can see different options available and different prices.